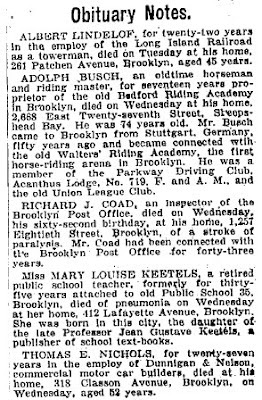 For budding genealogists, few discoveries are as satisfying as coming across an obituary. Here, in a nutshell, are all the salient details of a person's life, wrapped up in a brief, neat package. There is not, unfortunately, any comprehensive online collection of obituaries. Instead, one has to hunt and peck across numerous resources. Here are some of the best, though. It's very helpful to know the date of death of the relative you're looking for. Use the Social Security Death Index (SSDI) to find dates of death for those in the US, from about 1970 on. Many of the free resources highlighted here in this blog can also be very valuable in pinning down dates. If all else fails, try Ancestry.com, where some information is free, but full records will cost you. For the obituaries themselves, you'll need to search newspapers, of course, but which ones you search depends on what you know about when and where the death occured. Google News Archives is a good starting point, as it includes major papers, like the NY Times, along with obits from hundreds of small town papers, reaching back centuries. The comprehensive collection at NewspaperArchive.com is an excellent source of obituaries, but again, only tidbits are free, and you have to subscribe for full access. To search free newspaper archives in particular states, try FreeNewspaperArchives, and for international searches of newspaper archives, there's a wonderful collection at XooxleAnswers. Need more info? Here's a good guide to finding obituaries.